During my recent Jaeger-LeCoultre manufacture visit I had a chance to view and photograph the new Jaeger-LeCoultre Master Compressor World Chronograph, which was originally unveiled at SIHH 2010, in January. It is available in a 46.3 mm diameter stainless steel and titanium or 18k pink gold and titanium case (pictured). This new sports watch features a number of innovations that help the watch withstand tough conditions. The new Extreme World Chronograph is driven by an in-house 752 calibre automatic movement, and it is protected by an unprecedented air cushion shock absorber system. It features a vertical clutch, a large variable inertia balance and a laser-welded balance spring, which help with reliability, precision and endurance. The dial even features a rugged new material called Texalium™. 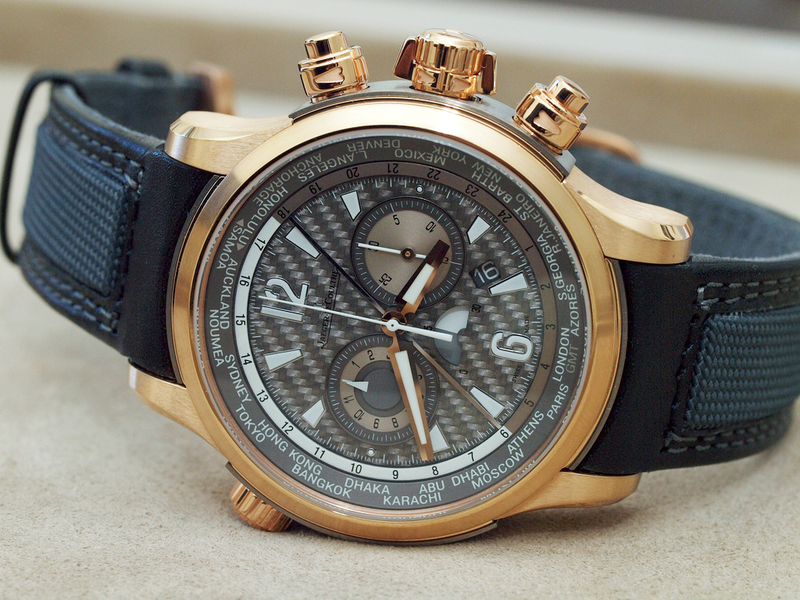 The new Master Compressor World Chronograph features a chronograph and world time functions. The chronograph pushpieces are screw locked, as is the crown, a signature of the Master Compressor line. The dial is made of a grey carbon fiber like material called Texalium™. Sub dials at 9 and 3 o’clock display chronograph hours and minutes respectively. A half-moon indicator at 6 o’clock is a movement operating indicator. An angled date window sits at 5 o’clock. A crown at 10 o’clock turns the internal bezel to one of 24 world time cities and instantly switches the central hour hand to that city. Each timepiece comes with interchangeable calfskin and rubber straps. The calfskin strap features a cool microfiber inner lining. The straps can be switched out without a tool, using the easy change button on each side of the caseback. Water-resistance is 100 meters. Power-reserve is 65 hours. (Ref. 1762450) 18-carat pink gold/titanium/calfskin leather/rubber, limited series of 200, (Ref. 1768450) stainless steel/calfskin leather/rubber, limited series of 500.